Custom chemical tanks for sale,Our factory Yuchai Dongte now provide you the new model chemical tanks body only,Every customers from other countries can choose their local best-selling truck chassis and then only buy the chemical road tanker body which is custom designed for your trucks.It is easy to connect our tanker body with your any brand trucks.It will help you to save import tax and you do not worry about the truck chassis after-sale service. 5.Tank manhole 3pcs, each chamber have 2pcs DN60 breath plastic ball valves,each chamber driver side have 1 unit DN100 PTFE butterfly valves with 1 units DN100 plastic ball valve with outlet.the rest details can be confirmed according to the factory drawing. 7. Payments terms:by T/T 100% (30%+70%).after signed contract. 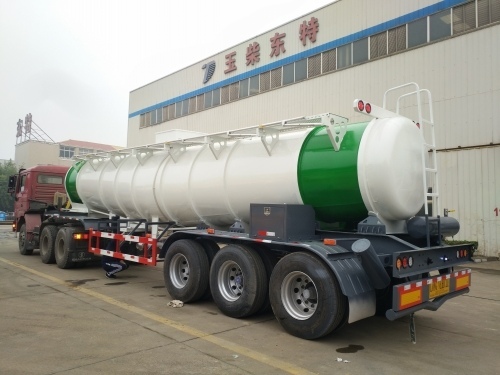 Looking for ideal Hydrochloric Acid Tanker Truck Manufacturer & supplier ? We have a wide selection at great prices to help you get creative. All the Hydrochloric Acid Tank Trailer Custom Design are quality guaranteed. We are China Origin Factory of Chemical Tanker Body for Sale. If you have any question, please feel free to contact us.